If you have included Corbett in your list of places to visit this summer, there is no way you can go wrong, because this wonderful park located in the arms of the Himalayas is unlike any park you have ever visited. Located in the state of Uttaranchal, India, it is the breeding ground of many rare and endangered species –the most popular being the Royal Bengal tiger. The park is named after the famous hunter-turned-conservationist Jim Corbett who is a towering figure in the Indian subcontinent; the man also played a crucial role in the setting up of the park. One of the most exotic wildlife destinations, the park is home to a diverse array of animals with the likes of leopard, elephants, spotted deer, sambar deer, barking deer, Himalayan goral, langur, and the Indian buffalo calling it their home. In addition, it is a magnet for birders as more than 585 bird species have been recorded here. It is spread over an area of 1,200 sq km. Best Time to Visit: November to June is the ideal time to spend some rare moments with the animals of the park. How to Reach: The nearest railway station to Corbett is Ramnagar Railway Station. In case you want to travel by bus, you should get to Anand Vihar ISBT/Kashmere Gate, New Delhi. Best Accommodation: For a comfortable and memorable accommodation, some best hotel options are Corbett Leela Vilas, Corbett Hideaway, and Infinity Resort. Spread over an area of 820 sq km, Rajaji National Park is set near the foothills of Himalayas and encompasses the enchanting Shivalik range of mountains in the state of Uttarakhand. The park is spread across three districts –Haridwar, Dehradun and Pauri Garhwal –and is named after the prominent freedom fighter C. Rajagopalachari (Rajaji), a Bharat Ratna recipient. 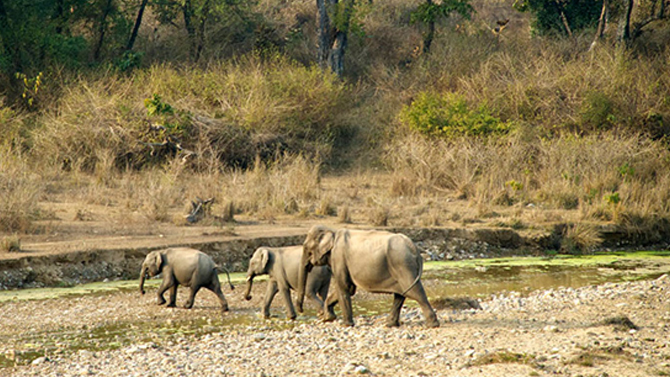 Created by merging three wildlife sanctuaries, namely, Rajaji, Motichur, and Chilla, the park today is home to the largest concentration of wild elephants in the whole of the state; this graceful but powerful animal continues to bring in crowd in droves who just could get enough of this mighty animal. Some of the other important animals of the park include the Bengal tiger, Leopard, Jungle cat, Sloth bear, striped hyena, Goral, and the Indian hare. For Delhiites, the trip to the park is pretty uncomplicated as they can easily hire a taxi to the park- which is some 235 km away from Dwarka; alternately those who have private vehicles can make the trip on their own. Best Time to Visit: The period from mid-November to June is the peak time to pay a visit at the park. How to Reach: If you are travelling by bus, get down at Rishikesh or Haridwar. Regular taxi and local bus services are available from here to the park. Best Accommodation:V Resorts- Rajaji National Park and Forrest Raja Ji National Park are ideal options for comfortable accommodation. If tigers hold a fascination for you, look no further than Ranthambore National Park where you are most likely to come across the big cat can lazily ambling across or sunbathing in an open area; the tiger census carried out in 2014 put the tiger count in the park at 62, which is up from 48 in 2013 and 25 in 2005. 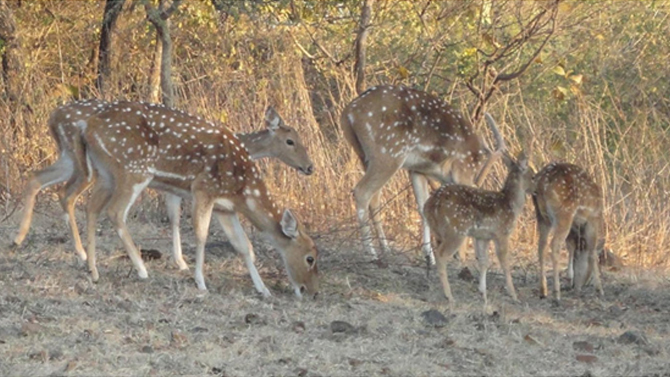 The park in addition to the tiger is home to many members of the deer family including sambar, chital and nilgai. 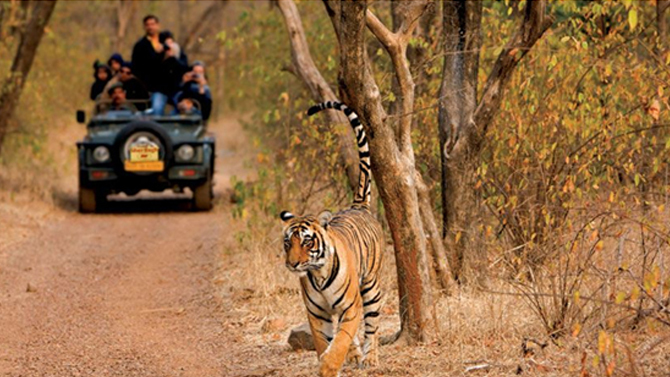 It sprawls over an area of 392 sq km and is located in Sawai Madhopur district, Rajasthan. The deciduous forests of the park also nurture animals like leopard, wild boar, hyena, and sloth bear; in addition, there are native and endangered birds that attract visitors in large numbers. Best Time to Visit: Book a date with the animals of your choice between November and April. How to Reach: The best thing to do is take a train to Sawai Madhopur Railway Station which is well connected to all major cities in India. From the station, book a bus or a cab to the park which is 10 km away. Best Accommodation: Some of the best places to stay in Ranthambore include Abrar Palace Wildlife Resort, Tiger Machan Resort, and The Tiger Villa. Another great pick, this reserve is throbbing with wildlife and is within close proximity of Delhi. The park is located in the district of Alwar in Rajasthan. Visitors on their visit to the park are immediately taken in by its unique topography consisting of arid forests, rugged landscapes, dry deciduous forests, rocks, tall grasses and hilly cliffs. Some time back in history, the park used to be a hunting area. 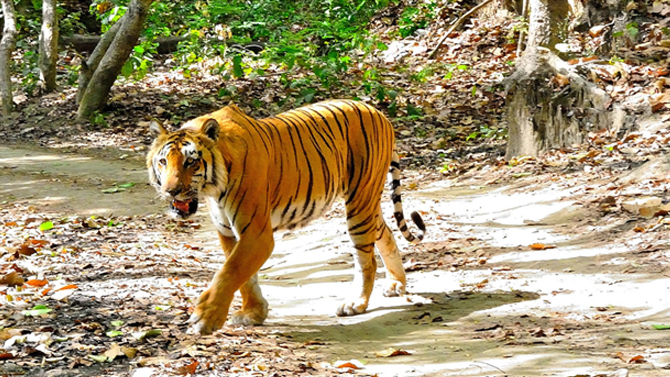 It was declared a wildlife reserve in 1955, and got recognized as a tiger reserve in 1978. Spread over an area of 866 sq km, the park is inhabited by a variety of animals including the Bengal tiger –which easily takes the cake, leopard, jungle cat, caracal, striped hyena, golden jackal, chital, sambhar, nilgai, chinkara, and four-horned antelope. How to Reach: Regular buses ply between New Delhi and the park, with the journey taking approximately 4 hours if you take NH8. Best Accommodation: After exploring wildlife for a long-day, some best places to spend night are Dadhikar Fort, Gulmohar Sariska Resort, and Ritumbhara Resort. 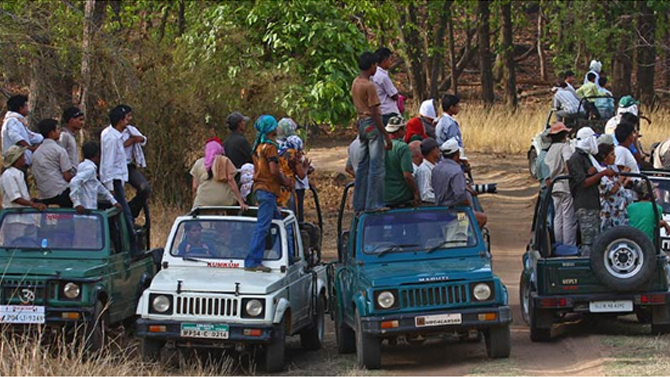 One of the most popular national parks in country, Bandhavgarh National Park became a national park in 1968. Spread over an area of 105 sq km, it is located in Umaria district of Madhya Pradesh. The USP of the park is its huge bio-diversity and it also has among the highest density of tigers in India. Another big cat that is found in the park is the leopard; the park is also a breeding ground for many rare species of deer. The park gets its name –which means Brother’s Fort from a well-known hillock and has a mythological angle to it with legends linking it to the Hindu God Rama. It is said that Rama entrusted upon his brother the responsibility to keep a close eye on Lanka (Ceylon). In 1993, the park added another feather to its cap as it was recognized as a tiger reserve. The park, which at one point of time used to be the hunting ground of the royal family of Rewa, has thickets of Sal forests, which is the predominant tree in the region apart from Bamboo. The climatic conditions of the park also vary extensively which has lead to a great variation in the flora and fauna that exist here; for example in summer temperature can soar up to 46 degrees centigrade. The average rainfall recorded is 1200mm. Best Time to Visit: Come here between mid-November and June when the park is covered in all its glory. How to Reach: You can fly to Khajuraho, which is the nearest airport. From the airport it takes around 7-8 hours by taxi. Best Accommodation:The Wildflower Resort, Goyals Tiger Inn Resort, and the Sun Resort are a few names that immediately come to mind while picking a place to stay in Bandhavgarh.